A step forward for Japanese advertising. The JAAA was created to bring advertising companies together, to stimulate the creation of new ads, and to foster quality advertising. 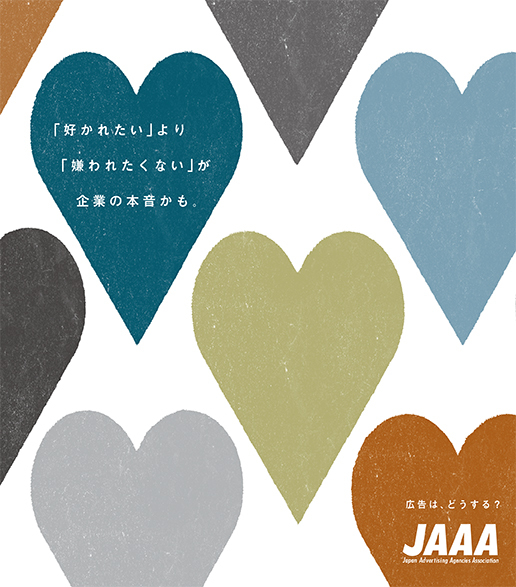 Since its foundation in 1950, the JAAA has grown considerably as the representative organization of the Japanese advertising industry. As of April 2017, our member companies account for approximately 76% of Japan’s total advertising expenditure of 3,907 billion (2017 Dentsu Survey), a figure which gives us a tremendous social responsibility. It is up to us to foster ads which benefit society as a whole and provide people with the information they need to improve their lives. Advertising plays a major role in society, and we at the JAAA will do our utmost to uphold its quality.